The Sun is connected to individualism, will and the conscious aspect of the personality. 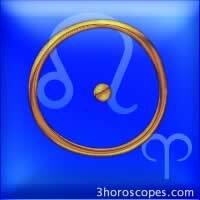 It is represented by a cercle with a point in the center because the central star shines and gives birth. The connection between the Moon and the Sun is the symbol of the masculine and feminine poles. Luminaries symbolically represent the parents but also the relationship with children. What we call "our sign" is the one in which the Sun was when we were born. "I am an Aries" means that the Sun was in the sign of Aries when I was born. Correspondences: with the sign of Leo (and Aries). Heart, eyes (right eye in particular). The man, father, husband for a wife. Sunday, gold.